The large molecules necessary for life that are built from smaller organic molecules are called biological macromolecules. There are four major classes of biological macromolecules (carbohydrates, lipids, proteins, and nucleic acids), and each is an important component of the cell and performs a wide array of functions. Combined, these molecules make up the majority of a cell’s mass. Biological macromolecules are organic, meaning that they contain carbon. In addition, they may contain hydrogen, oxygen, nitrogen, phosphorus, sulfur, and additional minor elements. Carbon contains four electrons in its outer shell. Therefore, it can form four covalent bonds with other atoms or molecules. The simplest organic carbon molecule is methane (CH4), in which four hydrogen atoms bind to a carbon atom. Figure 2.12 Carbon can form four covalent bonds to create an organic molecule. The simplest carbon molecule is methane (CH4), depicted here. However, structures that are more complex are made using carbon. Any of the hydrogen atoms can be replaced with another carbon atom covalently bonded to the first carbon atom. In this way, long and branching chains of carbon compounds can be made (Figure 2.13 a). The carbon atoms may bond with atoms of other elements, such as nitrogen, oxygen, and phosphorus (Figure 2.13 b). The molecules may also form rings, which themselves can link with other rings (Figure 2.13 c). This diversity of molecular forms accounts for the diversity of functions of the biological macromolecules and is based to a large degree on the ability of carbon to form multiple bonds with itself and other atoms. 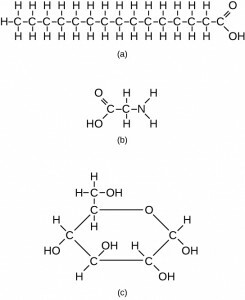 Figure 2.13 These examples show three molecules (found in living organisms) that contain carbon atoms bonded in various ways to other carbon atoms and the atoms of other elements. (a) This molecule of stearic acid has a long chain of carbon atoms. (b) Glycine, a component of proteins, contains carbon, nitrogen, oxygen, and hydrogen atoms. (c) Glucose, a sugar, has a ring of carbon atoms and one oxygen atom. 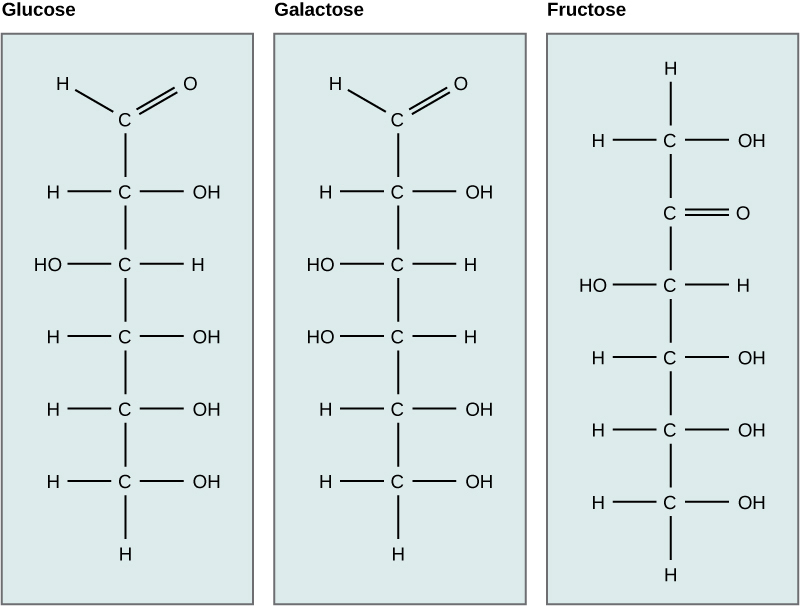 Galactose (part of lactose, or milk sugar) and fructose (found in fruit) are other common monosaccharides. Although glucose, galactose, and fructose all have the same chemical formula (C6H12O6), they differ structurally and chemically (and are known as isomers) because of differing arrangements of atoms in the carbon chain. 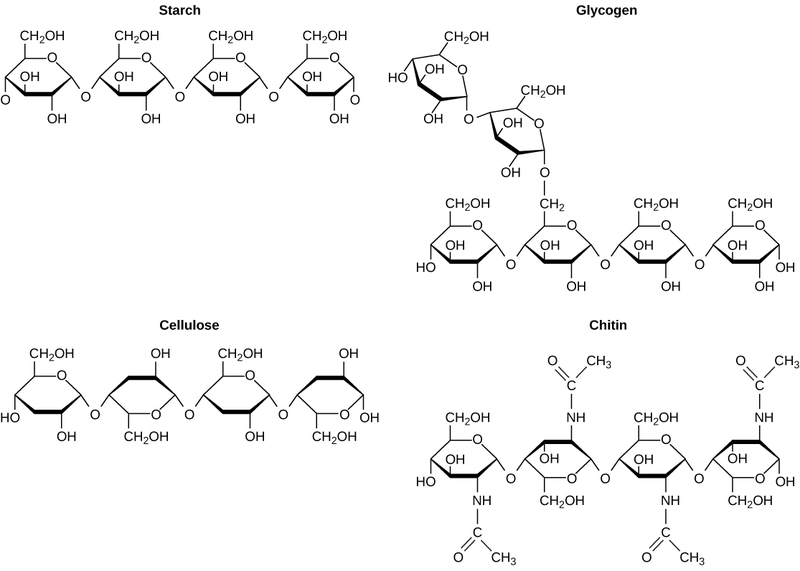 Figure 2.14 Glucose, galactose, and fructose are isomeric monosaccharides, meaning that they have the same chemical formula but slightly different structures. Thus, through differences in molecular structure, carbohydrates are able to serve the very different functions of energy storage (starch and glycogen) and structural support and protection (cellulose and chitin). Figure 2.15 Although their structures and functions differ, all polysaccharide carbohydrates are made up of monosaccharides and have the chemical formula (CH2O)n.
Registered Dietitian: Obesity is a worldwide health concern, and many diseases, such as diabetes and heart disease, are becoming more prevalent because of obesity. This is one of the reasons why registered dietitians are increasingly sought after for advice. Registered dietitians help plan food and nutrition programs for individuals in various settings. They often work with patients in health-care facilities, designing nutrition plans to prevent and treat diseases. For example, dietitians may teach a patient with diabetes how to manage blood-sugar levels by eating the correct types and amounts of carbohydrates. Dietitians may also work in nursing homes, schools, and private practices. Lipids include a diverse group of compounds that are united by a common feature. Lipids are hydrophobic (“water-fearing”), or insoluble in water, because they are nonpolar molecules. This is because they are hydrocarbons that include only nonpolar carbon-carbon or carbon-hydrogen bonds. Lipids perform many different functions in a cell. Cells store energy for long-term use in the form of lipids called fats. Lipids also provide insulation from the environment for plants and animals. 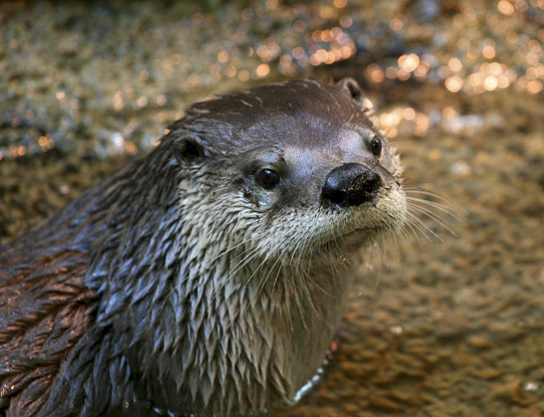 For example, they help keep aquatic birds and mammals dry because of their water-repelling nature. Lipids are also the building blocks of many hormones and are an important constituent of the plasma membrane. Lipids include fats, oils, waxes, phospholipids, and steroids. A fat molecule, such as a triglyceride, consists of two main components—glycerol and fatty acids. Glycerol is an organic compound with three carbon atoms, five hydrogen atoms, and three hydroxyl (–OH) groups. 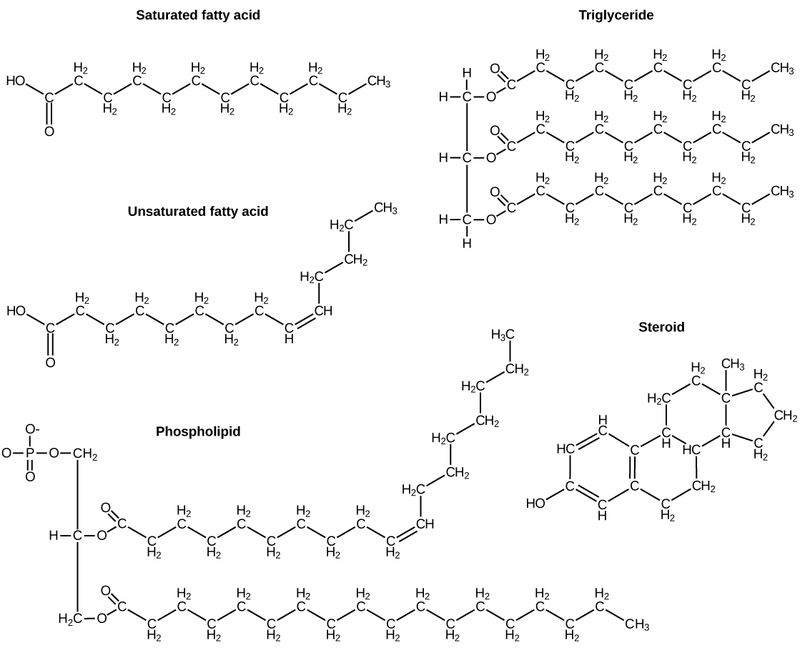 Fatty acids have a long chain of hydrocarbons to which an acidic carboxyl group is attached, hence the name “fatty acid.” The number of carbons in the fatty acid may range from 4 to 36; most common are those containing 12–18 carbons. In a fat molecule, a fatty acid is attached to each of the three oxygen atoms in the –OH groups of the glycerol molecule with a covalent bond. Figure 2.17 Lipids include fats, such as triglycerides, which are made up of fatty acids and glycerol, phospholipids, and steroids. In the food industry, oils are artificially hydrogenated to make them semi-solid, leading to less spoilage and increased shelf life. Simply speaking, hydrogen gas is bubbled through oils to solidify them. During this hydrogenation process, double bonds of the cis-conformation in the hydrocarbon chain may be converted to double bonds in the trans-conformation. This forms a trans-fat from a cis-fat. 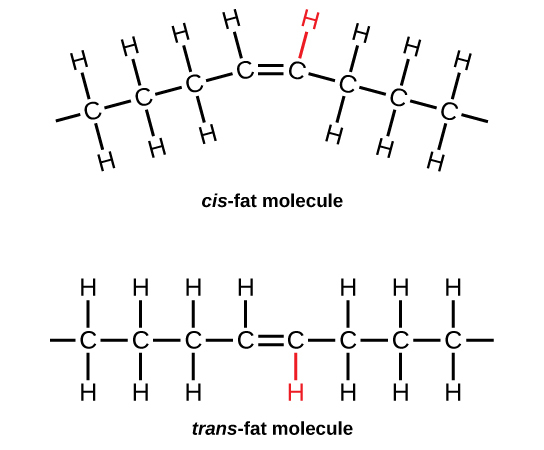 The orientation of the double bonds affects the chemical properties of the fat. 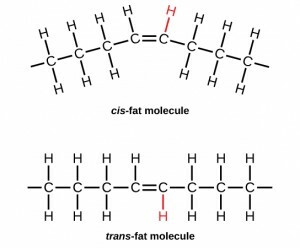 Figure 2.18 During the hydrogenation process, the orientation around the double bonds is changed, making a trans-fat from a cis-fat. This changes the chemical properties of the molecule. Amino acids are the monomers that make up proteins. Each amino acid has the same fundamental structure, which consists of a central carbon atom bonded to an amino group (–NH2), a carboxyl group (–COOH), and a hydrogen atom. Every amino acid also has another variable atom or group of atoms bonded to the central carbon atom known as the R group. The R group is the only difference in structure between the 20 amino acids; otherwise, the amino acids are identical. 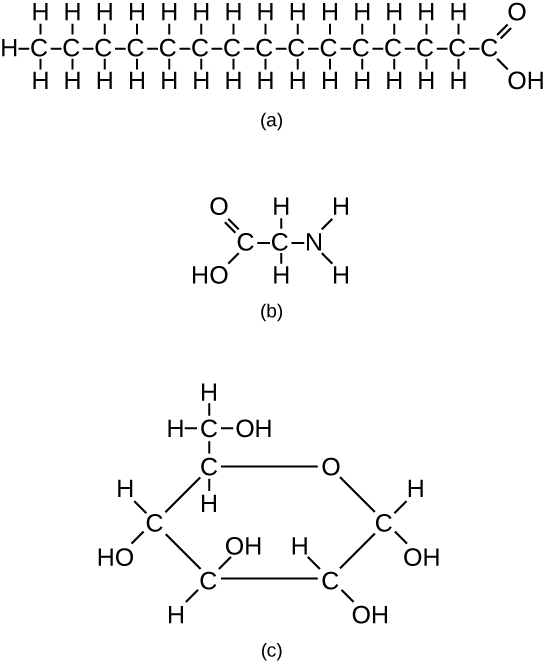 Figure 2.19 Amino acids are made up of a central carbon bonded to an amino group (–NH2), a carboxyl group (–COOH), and a hydrogen atom. 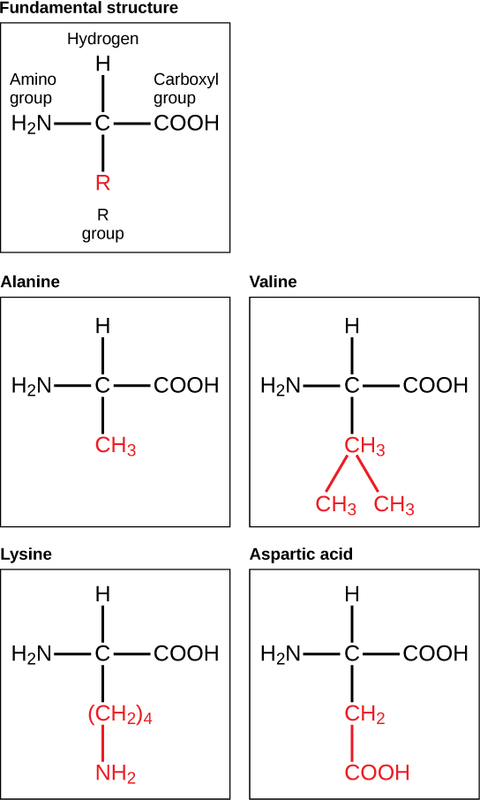 The central carbon’s fourth bond varies among the different amino acids, as seen in these examples of alanine, valine, lysine, and aspartic acid. The Evolutionary Significance of Cytochrome cCytochrome c is an important component of the molecular machinery that harvests energy from glucose. Because this protein’s role in producing cellular energy is crucial, it has changed very little over millions of years. Protein sequencing has shown that there is a considerable amount of sequence similarity among cytochrome c molecules of different species; evolutionary relationships can be assessed by measuring the similarities or differences among various species’ protein sequences. 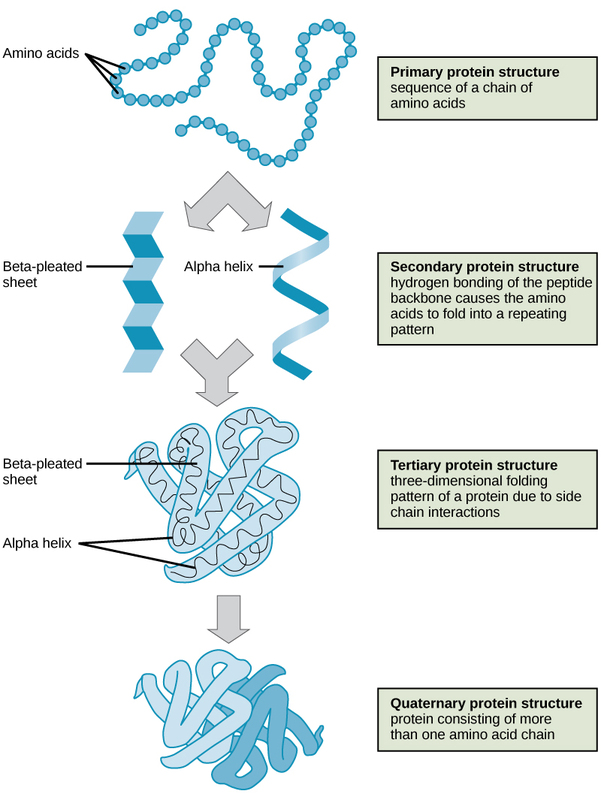 As discussed earlier, the shape of a protein is critical to its function. To understand how the protein gets its final shape or conformation, we need to understand the four levels of protein structure: primary, secondary, tertiary, and quaternary. DNA and RNA are made up of monomers known as nucleotides. The nucleotides combine with each other to form a polynucleotide, DNA or RNA. 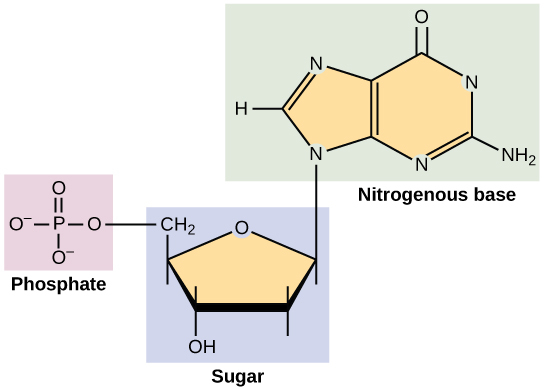 Each nucleotide is made up of three components: a nitrogenous base, a pentose (five-carbon) sugar, and a phosphate group . Each nitrogenous base in a nucleotide is attached to a sugar molecule, which is attached to a phosphate group. Figure 2.21 A nucleotide is made up of three components: a nitrogenous base, a pentose sugar, and a phosphate group. DNA has a double-helical structure. It is composed of two strands, or polymers, of nucleotides. The strands are formed with bonds between phosphate and sugar groups of adjacent nucleotides. The strands are bonded to each other at their bases with hydrogen bonds, and the strands coil about each other along their length, hence the “double helix” description, which means a double spiral. 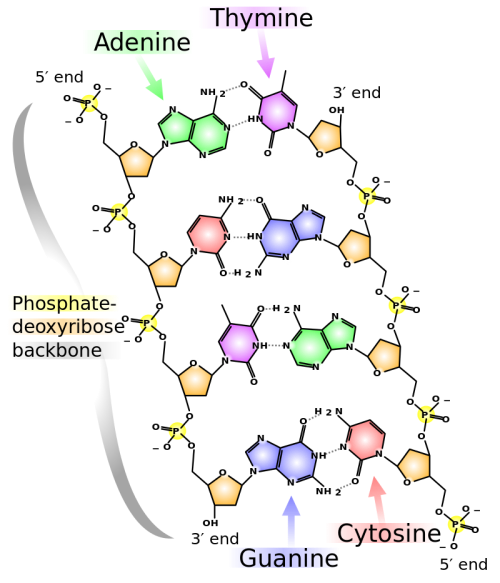 Figure 2.22 Chemical structure of DNA, with colored label identifying the four bases as well as the phosphate and deoxyribose components of the backbone. (Chemical Structure of DNA by Madeleine Price Ball is CC0). The alternating sugar and phosphate groups lie on the outside of each strand, forming the backbone of the DNA. The nitrogenous bases are stacked in the interior, like the steps of a staircase, and these bases pair; the pairs are bound to each other by hydrogen bonds. The bases pair in such a way that the distance between the backbones of the two strands is the same all along the molecule. The rule is that nucleotide A pairs with nucleotide T, and G with C, see section 9.1 for more details. 2.3 Biological Molecules by Charles Molnar and Jane Gair is licensed under a Creative Commons Attribution 4.0 International License, except where otherwise noted.